Today starts this year's FantasyFilmFest in Munich. I am not really in the mood for it this year, so I got myself tickets for only four movies. Last year I watched eleven movies. Should I post what I decided to watch, or do you want to be surprised when I post a short review for each? Tucker and Dale are two well-meaning hillbillies who just bought the vacation home of their dreams - a run-down, lakefront cabin in the middle of the woods. Only their peace is disrupted when a group of rowdy college students choose their area of the forest to go camping. When one of the girls falls into the lake (a result of Tucker and Dale startling her), they bring her back to their cabin to bandage her up. The catch: when they tell her friends they have her, the teens think they had kidnapped her. A chain of hilarious misunderstandings ensue, consisting of the teenagers accidentally killing themselves in front of the unsuspecting (and truly baffled) Tucker and Dale. Great start for my this year's FantasyFilmFest marathon. 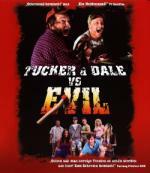 Tucker (Alan Tudyk from Firefly) and Dale are two good-hearted hillbillies who are mistaken by some college kids for a couple of killers because of some preconceptions and a lot of unfortunate accidents through which the college kids loose their lives one by one. This movie was real fun. It is for slasher movies what Shaun of the Dead was for zombie movies. I think I will get this one on DVD when it comes out. This time around I think I chose the wrong movie. This Jackie Chan film I found incredibly boring and it will definately not make it into my collection. I hope the rest of my choices were better. A strange movie. It is two separate storylines which only come together at the end in a very strange way. One story is about an Japanese-Mexican family where the father is having a wrestling match that day. It is a rather straight forward storyline. The other is very strange: A Japanese man is imprisoned in a very strange white room with a lot of "switches" in the wall. Each one of these does another, often bizzare, thing. You watch him trying to get out of this room and often funny ways and you see him getting more and more desperate. This is a movie I can recommend again. A handful of young men set out to take on the decadent West but are more of a threat to themselves than anyone else in this black comedy from the creator of Brass Eye, Chris Morris. Omar (Riz Ahmed) is a devout Muslim living in the United Kingdom who has decided to form a terrorist cell to bring forth a jihad against a culture he believes is dominated by the sinful and ignorant. However, Omar isn't much of leader, and he's assembled an unimpressive team of fellow terrorists, among them Waj (Kayvan Novak), who lacks the brainpower to come up with ideas or direction on his own; Faisal (Adeel Akhtar), who is shy and doesn't have much to say; and Barry (Nigel Lindsay), a recent convert to Islam who tries to make up for his lack of practical knowledge with fierce passion. As Omar and his comrades debate both doctrine and methods, they ponder such notions as using birds as explosive devices, creating video communiqués with a hip-hop flavor, and attacking mosques in an effort to provoke non-violent Muslims. But are Omar and his partners a legitimate threat to the safety of Great Britain, or just four half-bright twenty-somethings with more bluster than imagination? The announcer said in the beginning, that this one probably will have a hard time to get a proper theatre release. "Who would want to watch a comedy about suicide bomber... except for you guys"
I enjoyed it. This one is another I can recommend. It's about some Pakistani guys living in Britain and planning to do a suicide bombing. You see them trying to make a video. You see them being totally paranoid. Firing a bazooka while holding it the wrong way. And one of the also accidentally blows himself up. This was it for me for this year's Fantasy Film Fest. There is one other film I would have liked to watch but it comes during the day on a work day. It's TiMER, a interesting sounding rom-com with Emma Caulfield (Anya from Buffy). But I see that there is already a RC1 DVD release, so I will probably get that one. The announcer said in the beginning, that this one probably will have a hard time to get a proper theatre release. "Who would want to watch a comedy about suicide bomber... expect for you guys"
I saw this a couple of months back. It is astonishing and I highly recommend it. You will laugh, even while your jaw drops at the audacity! I saw it with a friend from work who is Muslim and he laughed like a drain, then started to get mad... then laughed till he cried... then got mad again! 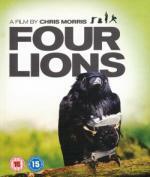 It is a very clever film and perfectly walks a tightrope. You sympathise with these idiots, even though they are so dangerous. The best way I came up to describe its tone is The Full Monty. It's one of those middle of the road films in terms of humour and the balance between serious and funny. But that in no way prepares you for how challenging it can be. It was short this year Tom... Usually you watch a lot more film than that. The last one you have reviewed is the one interesting me the most. Let us know when it will get a dvd release (the zone isn't a big deal to me). As I mentioned in my opening post, I was not really in the mood for it this year. The last two years I watched eleven movies each. The year before it was five movies (it was my first FantasyFilmFest). There is also a Blu-ray release available. I was going to say, UK region 2 is the best bet. It's been out here quite a while, but it's such a small film and a hard sell for some distributors. I really can't see it doing well in the States! A strange movie. It is two separate storylines which only come together at the end in a very strange way. Sounds like the concept of Babel. So, ive been slow around here recently and only just noticed this! !